The North American songbird known as the robin is a colorful character which also serenades gardens with song. The bird lives all over the United States and moves north in the summer to breed, which is noted in their Latin name "Turdus migratorius". Robins play an important role in dispersing a variety of seeds across an area so new plants can grow, and they also eat several species of insect pests. An adult male robin has a grayish back, a red chest and a dark-colored head. The females have duller coloring than the males, and a slighter lighter head. Robin's bills are yellow and the eyes are partly surrounded by a white ring. When the birds are in flight, a white patch on the stomach near the tail is more obvious. The wings are 14 to 16 inches in width and are grayish. The robin's tail feathers are darker and the outside feathers have a white spot on the tip. Young birds have a pink bill and have blackish spots on the breast. A robin uses its eyesight to catch worms to eat. The bird also eats insects such as beetles and grasshoppers. Other options for a robin diet include fruit like cherries, grapes and even mistletoe. A male robin uses its red chest as a signal of masculinity during the breeding season, which is in summer. Robins can get confused when they see their reflections and can attack the reflections while under the impression another male is in their territory. Female robins build nests out of mud, sticks and grass and then lays three to five eggs. The eggs are blue and glossy. The female incubates these eggs for two weeks. 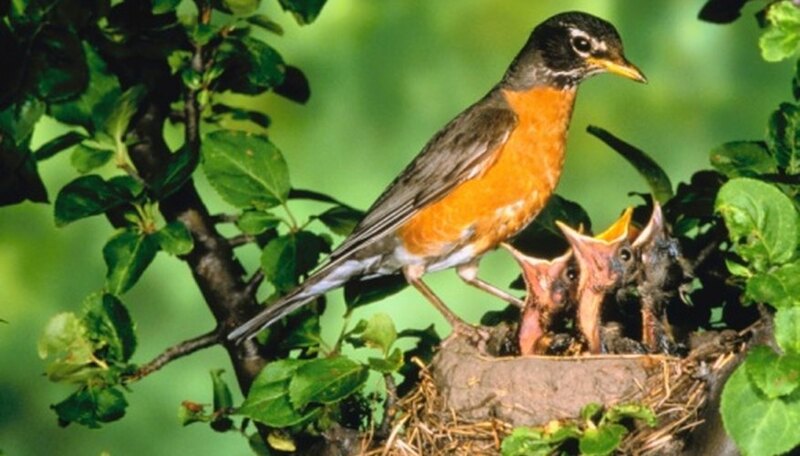 Both the male and female robins look after the hatchlings until they are ready to leave the nest two weeks later. Even then the parents help the chicks to feed for another two weeks. The birds sing in the morning, before the sun rises, and some people use the sound of a robin singing to herald the beginning of spring. They tend to twitch their tails down repetitively after landing. The birds travel in groups during fall and winter and roost together on trees. The robin lives in many habitats across the U.S., from back gardens to deciduous forests. Parks, meadows, pine forests and tundra can also be home to the songbird. Robins migrate north in the summer to breed, and move to the southernmost parts of the U.S. for warmer climes in the winter. O'Keeffe, Jillian. "What Are Traits of the Robin?" Sciencing, https://sciencing.com/traits-robin-8434772.html. 24 April 2017.